March 5th 2018 proved to be a very important day for Cashel Community School TY French students as we welcomed back past pupil Sinéad Magner to facilitate a workshop on Franglais – the rising trend of the use of English within the French language. It was a great honour for the school to have Sinéad to facilitate this workshop as she has excelled in her study of French since leaving the school in 2013. Her accomplishments began in her undergraduate studies in Maynooth when she was awarded several prizes for her studies in French namely Maynooth University Prize for “Best final year dissertation”, French government Medal and NUI prize for “Proficiency in French” for her final year work and the Dr. H.H. Stewart “Literary Prize in French.” Her studies of English and French included a year attending university in France. At present Sinéad is completing an LLM in Gender, Conflict and Human Rights in Ulster University. Whilst in Cashel Community School Sinéad was taught by Ms Lisa Williams. Her workshop focused on the use of Franglais and how the French are now borrowing words from social media and fashion in English and integrating them into modern day French. The TY students from Ms Barry and Ms Tierney’s classes were thrilled to guess what these words meant and to discover how to use them correctly and in context. Throughout her workshop Sinéad actively promoted the study of and the importance of language learning in secondary school and at third level. The general consensus at the end of the presentation was “Je Like”! 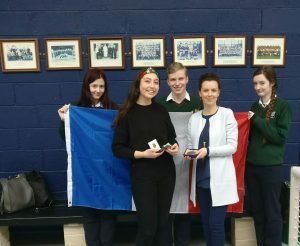 Sinéad Magner with Ms. Lisa Williams (French Teacher) and students Torija Skietniece, Lorcan Reade & Nikita Walsh.